Last semester I gave a presentation on knighthood and chivalry for the middle school where this young man was studying. We talked about honor and heroism, and I even went through a knighting ceremony for the students. Now, David is in high school, and he was kind enough to share this poem with readers here — a reminder that the next generation is always watching and absorbing. Where are the heroes of today? The leaders, the warriors, the valiant ones. Times of misdirection, traveling away from the light of the sun. 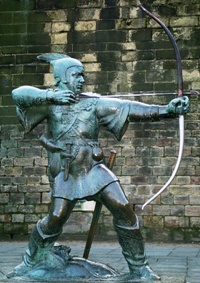 Where is the Robin Hood of today? For we need him now. He did it with guts, with talent, and because he knew it was right. What do these rich ones do? Give water to the dry, thirsty lives of the people. Bask on it while others starve. Raid the dragon’s treasure, and return it to those in need. We need the Robin Hood of today. Where is the King Arthur of today? He and his knights rode across the land, vanquishing evil wherever they found it. They did it with courage, with honor, and because they knew it was right. They would help those in trouble, give to those in need. Evil runs rampant in the streets, hunger and pain close beside. Hurting and killing all whom it touches, even those foolish enough to join with it, to fall within its grasp. Homeless people starve in alleys, hiding from death any way that they can. People who enjoy hurting others. Where are those who would stop it? But with a limited degree of success. They are limited by society, by fear, by doubt. We need the King Arthur of today. There are many things wrong with the world of today. Poverty and hunger, sickness and war. But one of the greatest problems is that there are fewer heroes of today. Who will the bards sing about in the days to come? Warriors and leaders to guide us into the days ahead. Who will lead us? Who will guide us? We need the heroes of today. About the Author: David Ford is a high school freshman in San Diego, California. He is 15 (almost 16), and has enjoyed medieval, Renaissance and Civil War re-enactment for all his life. He grew up listening to tales of knights and honor, and continues to be fascinated by them today.